Registering your theme enables automatic updates and support for you theme. This means that any updates we publish for your theme can be automatically applied using the WordPress update system, and enables your site as eligible for support in our system. Before registering your theme, you'll need the email you used when purchasing your theme, and the License key for the order. You can find the license key in your original order receipt OR by logging into the My Account section of our website and clicking the My Licenses tab. 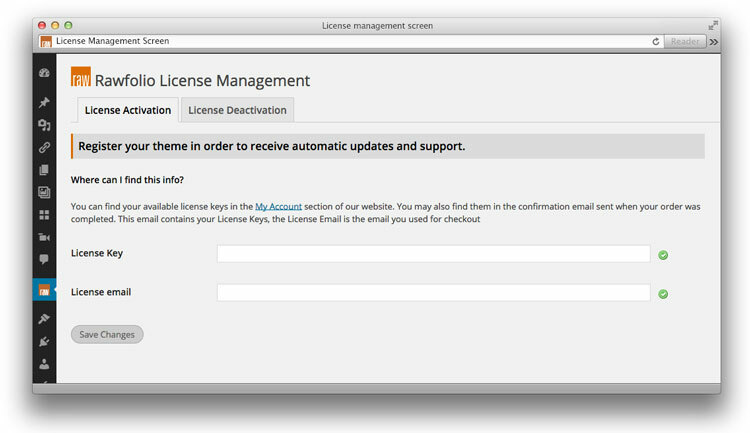 After navigating to the license management page, you should see a screen like the one below. 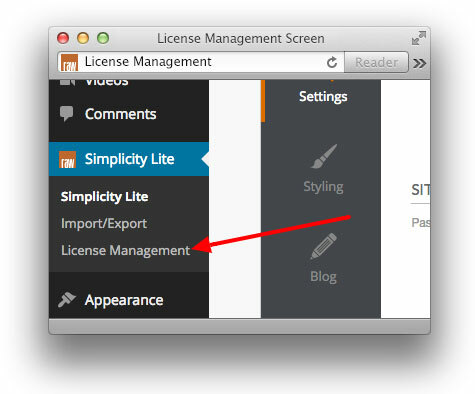 Simply enter your license key and email in the fields and click the Save Changes button. This will contact our registration server and as long as the email and keys are valid, will register your theme. If the theme is registered successfully, you will see a confirmation message at the top of the screen, as well as two green checkmark icons appear next to the fields just like in the image below.